Spain, Fuengiola (4/23/10)...Business team culture expert Dianne Crampton of Bend, Oregon and author of TIGERS Among Us: Winning Business Team Cultures and Why They Thrive, was among the tens of thousands of travelers who found themselves stranded in Europe due to the Icelandic volcano eruption. Crampton was in Europe taking a look at team behavior in certain business operations on the continent. The prolonged airline chaos gave her a chance to observe up close and personal institutional responses to a crisis for which airlines and governments were clearly unprepared to handle. Crampton found herself stranded in southern Spain unable to catch flights to Paris and then on to the U.S. Information from the airlines, governments and media, she said was always confusing and often contradictory. Travelers struggled with decision-making: Do I go to the airport? Do I rebook? Do I simply sit and wait? How will this impact my job?What if the volcano blows again? “How airline authorities, businesses and governments dealt with the crisis either calmed or added to the chaos caused when up to 80,000 people were stranded daily by flight cancellations,” Crampton said. 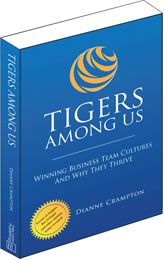 Crampton’s book TIGERS Among Us provides breakthrough guidance on corporate behavior that not only improves customer satisfaction and customer loyalty but also improves team business practices that leads to increased business success. She defines an approach to corporate behavior that allows for the satisfaction and productivity of both customers and business by employing ethical behaviors that support trust, interdependence, genuineness, empathy, risk and success – TIGERS -- in the workplace and that meet the closest scrutiny. Those European businesses that calmed the chaos, according to Crampton, extended traveler lodging at reduced cost, assisted travelers with information that improved their problem solving, helped British travelers to cooperatively hire tour busses to take them to ferry terminals in France so they could cross the channel into England and offered discounts on meals. And for those travelers who opted to stay put like Crampton, as more good information filtered through the chaos, better decisions were made. “What this shows to other tourism-related businesses is that it is important to think through and anticipate any crisis or challenge that calls for contingency planning. This is a worthwhile exercise for teams to contemplate and could help strengthen business strategies that lead to success,” adds Crampton. Crampton’s book offers guidance on how businesses can build strong teams and stakeholder relationships that will benefit them in challenging times, such as the April airline crisis. Condominium travel clubs allowing stranded guests to extend their stay on a week by week basis when space was available and when air flights were cancelled. Small merchants willing to accept foreign currency from travelers unable to access euros so that travelers could purchase emergency food and necessities. The common practice is to refuse the currency and make travelers take the bills to banks for exchange. The practice of transferring the problem to banks results in heightened anxiety and more problems for tourists already impacted by scarcity. ​Small restaurants that patched together wholesome and affordable meals for stranded travelers at affordable prices experienced a rush in business. Stranded travelers who were looking for affordable meal options were quick to refer restaurants to fellow stranded travelers. They were also quick to report experiences of dissatisfaction as well. Therefore, those businesses that behaved fairly, offered good meals at a modest profit benefited as traveler resources grew more depleted. Free Wi-Fi to help travelers communicate with airlines and to stay current with evolving weather information and news. Dianne Crampton founded TIGERS Success Series in 1987 and has helped merging companies and entrepreneurs build highly successful businesses. 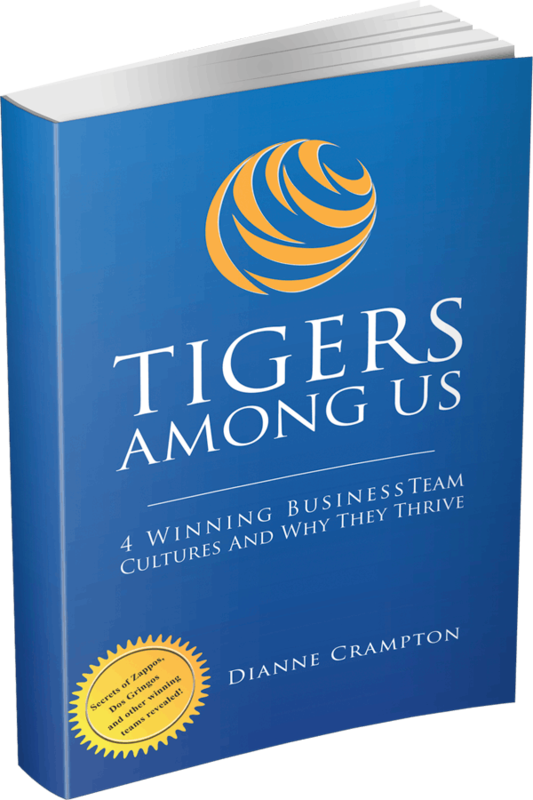 In TIGERS Among Us she shows how businesses such as Tribe, Inc., Zappos.com, 4Refuel, and Dos Gringos have built highly successful businesses that demonstrate trust, interdependence, genuineness, empathy, risk and success on a day-to-day basis. For more information go tohttp://www.TigersAmongUs.com or contact Dianne Crampton at tigers@uci.net. TIGERS Among Us: Winning Business Team Cultures and Why They Thrive is published by Three Creeks Publishing ( March 2010).